It could be widely and perhaps fairly assumed that when modern audio technology is installed into a 650 year old timber building, some degree of aesthetic compromise is inevitable, in order to achieve a successful sonic outcome. When POLARaudio, in conjunction with installers Saville Audio Visual, was approached to provide a new speech and background music system into just such a building, the brief did not allow for such luxury. 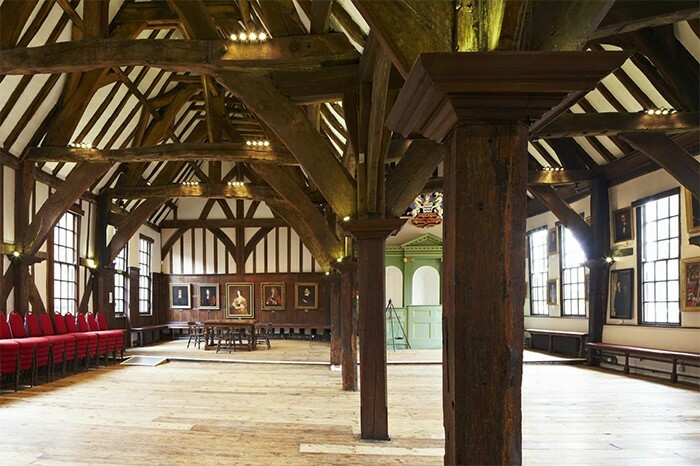 Construction of The Merchant Adventurers' Hall in historic York began in 1357 and today, over 650 years later, it is still in use as a fully functioning museum, wedding and hospitality venue and meeting place. 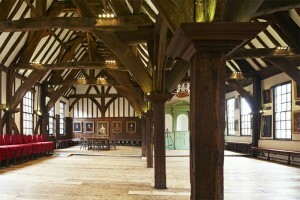 As one of the finest surviving medieval guild halls in the world, the facility is Grade 1 listed and is the largest timber-framed building in the UK still being used for its original purpose. The architectural and historical significance of this beautiful building cannot be underestimated. During its existence it has been victim to weather events and to changing fashions and each has altered its appearance to a greater or lesser degree but still it remains as a striking and evocative link with the past. Naturally, English Heritage were adamant that the fabric and appearance of one of England's finest medieval buildings should remain as undisturbed as possible by any outside intervention. The installation was to cover two separate rooms, having the capacity to operate independently in each, or across the venue as a whole. The interior of the entire building comprises a timber framework of pillars and beams, wooden floors and very little in the way of soft furnishings or surfaces. The first action was to remove some 16 existing speakers. At a stroke this would improve the aesthetic, provided that the new solution could be more discrete... Three systems were installed across the two rooms to best serve the requirements of the brief. The large room was equipped with a speech and background music system as well as a conferencing system, whilst the small room had its own speech-only system. Audio from each of these systems could be fed across all or part of the venue to retain maximum flexibility. Central to achieving the aims set out in the brief was the utilisation of two colour-matched Renkus Heinz ICONYX IC 16 speakers in the main room. These architecturally transparent speakers are designed to be heard but not seen, mounting flush on walls and pillars. In this case the two speakers blended almost invisibly on timber pillars. Replacing the aforementioned 16 speakers with two might have indeed reduced the visual impact of the system in the hall but of course that was only half the battle. The other side of the equation was to achieve near perfect sound reproduction across the whole area. The ICONYX IC 16s met the challenge with style and great efficiency. The speaker technology enables sound designers to cover almost any audience area perfectly. Multiple sonic beams can be individually shaped and aimed from a single ICONYX array with great precision. In the main hall this precision was fundamental not only to ensure accurate, natural sound across the required area but also to avoid some of the pitfalls associated with the interior's many hard surfaces and vaulted ceilings. It is no exaggeration to say that far from compromising the visual aesthetic of this most atmospheric of spaces, the installation constituted a net improvement on what had existed before, as well as improving, beyond all measure, the quality of the sound on offer. At the heart of the system (taken as a whole) is an Mc2 T4-250 amplifier and Biamp Nexia CM DSP Processor, alongside the Renkus Heinz ICONYX IC16s, as well as Renkus Heinz CFX 81 and CFX 61 speakers situated in the smaller room or Undercroft. Two Biamp Red 1 controllers are employed to facilitate the required independent source selection and volume control. All the wireless radio microphones for speech and conferencing were from Beyerdynamic. For speech, the system utilises two PEM60 head worn and two SDM960M hand held microphones and for conferencing employs a Beyerdynamic MCS system, comprising an MCS223 Chairman's mic and 16 MCS 221 delegate mics. CD and iPod inputs were installed in the main room, as well as an additional iPod input in the small room. The flexibility required by the hirers of the facility was thus more than comfortably met by the systems put in place. This collaboration between POLARaudio and Saville Audio Visual demonstrated the highly constructive nature of their ongoing relationship. Having operated under the acute gaze of English Heritage in a sensitive Grade 1 listed building, POLARaudio business development manager Mark Bromfield, was entitled to express satisfaction at a job well done: "The Heritage people were understandably quite stringent in their demand that the installation should sit as invisibly as possible in its surroundings. The Merchant Adventurer's Hall is a beautiful building inside and out and we were conscious of our responsibility to meet this part of the brief as sympathetically as possible. Having colour matched the speakers as closely as we could, they were then installed to blend with the timber-work … the sophistication of the ICONYX speaker technology meant we could overcome the many difficulties that a space like this might present. 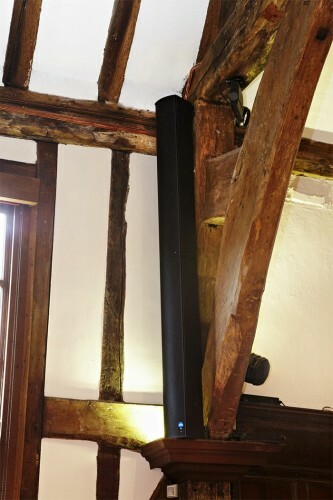 We felt confident that we had succeeded when the first post-install visitors didn't actually notice the speakers and yet were knocked out by the quality of the sound!" No-one could claim that the provision of a new speech and background music system for The Merchant Adventurer's Hall in York was the largest, the most complex or the most difficult undertaken by POLARaudio. In spite of this, it rates extremely highly, serving, as it does, to illustrate that 21st Century cutting edge sophistication can not only sit comfortably amongst the timbers of a 14th Century meeting house but do so quite invisibly and in such a way as to actually better support the original purpose of the building. For an unbroken 650 years people have been meeting, eating, drinking and conducting all manner of business in this unique space. The Merchant Adventurers of today approve of their state of the art sound system – it would seem reasonable to speculate that their enterprising predecessors would have shared this enthusiasm.